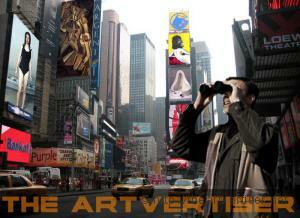 The Artvertiser is an urban, hand-held 'Improved Reality' project that re-purposes street advertisements as the surface for exhibiting art. Instrument of conversion and reclamation, The Artvertiser situates the 'read-only', proprietary imagery of our public spaces as a 'read-write' platform for the presentation of non-proprietary and critically engaging content. During this 3-days 'Artvertising' workshop, participating artists will have the opportunity to create visual works to replace urban advertisements in Brussels. They will be able to experiment and analyse real time computer vision techniques developed by Julian Oliver and his team. The results of the workshop will be presented for the MFF 2010 Finissage on Saturday afternoon 2nd of October, 2010. During 'augmented' walks in the city, the audience will be able to watch the creations made through specially built binoculars (or Billboard Intercept Units). For Artvertiser in Brussels, two new binoculars (Billboard Intercept Units) will be produced by iMAL and V2_ Lab. 'The Artvertiser' has been initiated in 2008 by Julian Oliver and is being developed in collaboration with Damian Stewart. New Zealander based in Berlin, Julian has been active in the critical intersection of art and technology since 1998. His projects have been presented at many museums, international electronic-art events and conferences, and received several awards. Julian has also given numerous workshops and master classes in software art, augmented reality, creative hacking, data forensics, object-oriented programming for artists, virtual architecture, artistic game-development, information visualization, UNIX/Linux and open source development practices worldwide. In 2008, he initiated 'The Artvertiser' in collaboration with Clara Boj, Diego Diaz and Damian Stewart. Damian Stewart is an artist working with light, sound, and technology, originally from New Zealand and currently based in Vienna, Austria. Through the construction of specific corporeal and psycho-corporeal experiences his work explores the relationships between audience, artwork and artist, and is based on a solid understanding of the history, material properties, and aesthetic possibilities of the systems with which he works. Recent work includes installations, light performances, and environment sonification pieces. Damian has a diverse background that includes study in electroacoustic music, interior architecture, and computer science; professional software programming work on interactive museum installations and PlayStation2 games; and various music performances including free-jazz orchestras, solo electroacoustic improvised performances, and an electronica/dub band. He is a member of the New Interfaces for Performance (N.I.P.) collective, has performed internationally alongside artists including Biosphere and Deadbeat, and collaborated on projects in the UK, Netherlands, Austria, Germany, France, Portugal, Spain, Slovenia, and New Zealand. Damian has been artist-in-residence with groups in the Birmingham, UK; Lisbon, Portugal; and Ljubljana, Slovenia. Participating artists: Ireti Olowe, Peter Snowdon, Philippe Elipeo, Alec De Busschère, Annick Blavier, Melis Tezkan, Khanh Vong, Laura Colmenares Guerra, Vadim Vosters, Stef Meul, Marika Konstantinidou, Olivier Finn, Adelaide Francois, Nicolas Kunysz, Olivia De Grez.